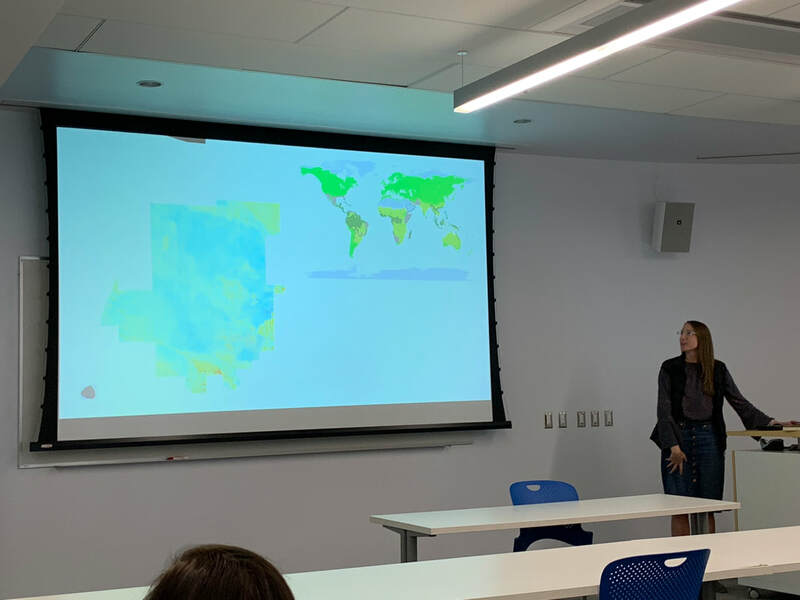 The 2019 Earth week SNRExpo showcased the research of SNRE. 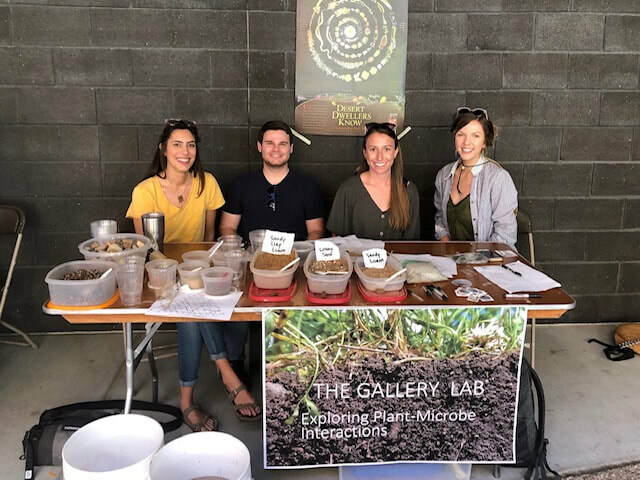 The gallery lab showed some of the variety of the soils in Arizona and challenged visitors to create a well-draining soil profile and compete in water-infiltration races. Congratulations to SNRE's own Amy Hudson for first place! Congratulations to Noelle Espinosa, who received the Marshall Foundation Dissertation Fellowship! You can learn more details about Noelle's research here. Dawson passes her qualifying exam! Please join us in congratulating Dawson Fairbanks on completing her qualifying exams! Please join us as the 2017 William G. McGinnies scholarship recipient, Martha Gebhardt, will present her dissertation work November 16th. The talk is titled, "Shrub encroachment alters ecosystem processes: linking imaging spectroscopy and microbial biogeochemistry." You can find more information about her presentation here. 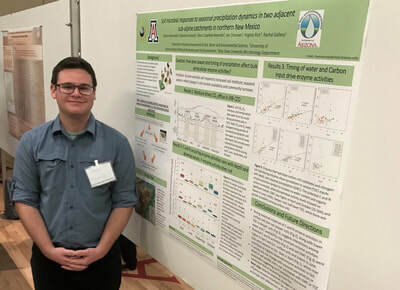 Martha Gebhardt and Chance Muscarella presented their research at the 15th annual Research Insights in Semiarid Ecosystems (RISE) symposium. Martha presented 2 posters, the first titled, "STEM at SRER" and the second titled, "The use of plant hyperspectral signatures to look below ground at the Santa Rita Experimental Range." Chance presented his poster titled, "Seasonal responses of soil microbial communities in the Jemez River Basin," highlighting the research he and Ph.D student Dawson Fairbanks have done as part of the Catalina-Jemez Critical Zone Observatory. He displayed some of the results they have obtained that quantify the effects of seasonal variation and site factors on microbial enzyme activity rates and biogeochemical cycling of nutrients. Early deadline July 25th / final deadline August 1st. Microbes play critical roles regulating terrestrial biogeochemical cycles. Linking processes controlling nutrient transformation and storage with disturbance responses and feedbacks to climate change is a global research priority. Studies that integrate biogeochemical approaches focused on nutrient pools and fluxes with microbial ecology approaches examining community physiology, traits, and structure reveal the complexity of interactions influencing ecosystem responses. How do individual microbial traits influence community stability and response to disturbances? How does microbial community structure change across gradients and influence vegetation dynamics? How can we use this information to predict large-scale fluctuations in soil carbon and nutrient storage? Although advances in molecular and genetic tools are improving our understanding of how microbial processes influence ecosystems, questions surrounding the level of detail appropriate to best predict environmental response to change remain. We invite cross-disciplinary studies that investigate microbial-driven responses along environmental gradients, to disturbance, and/or in the context of climate change. Congratulations to Chance Muscarella and Clarisa Avalos who presented their research at this year's SWESx poster session. 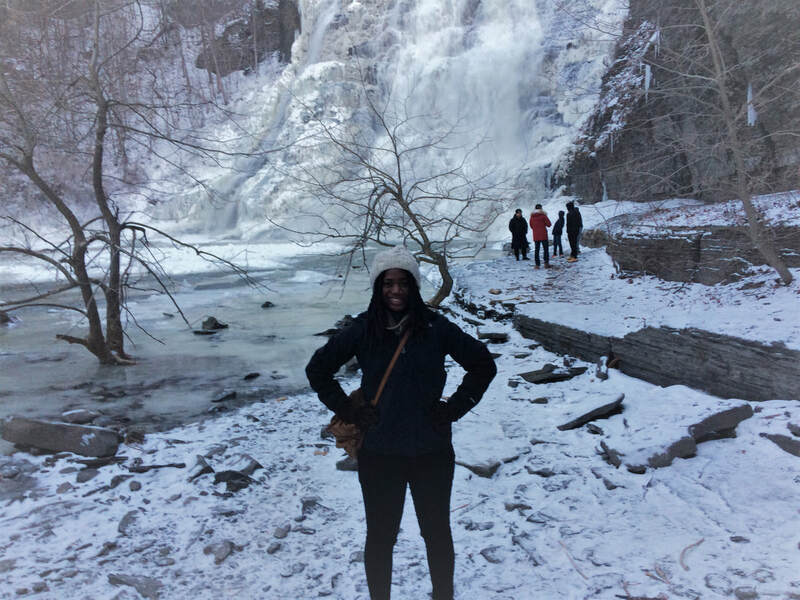 Congratulations to Sudan Kariuki who will officially be joining Jed Sparks' lab in the Ecology and Evolutionary Biology department at Cornell University in Fall 2018!! 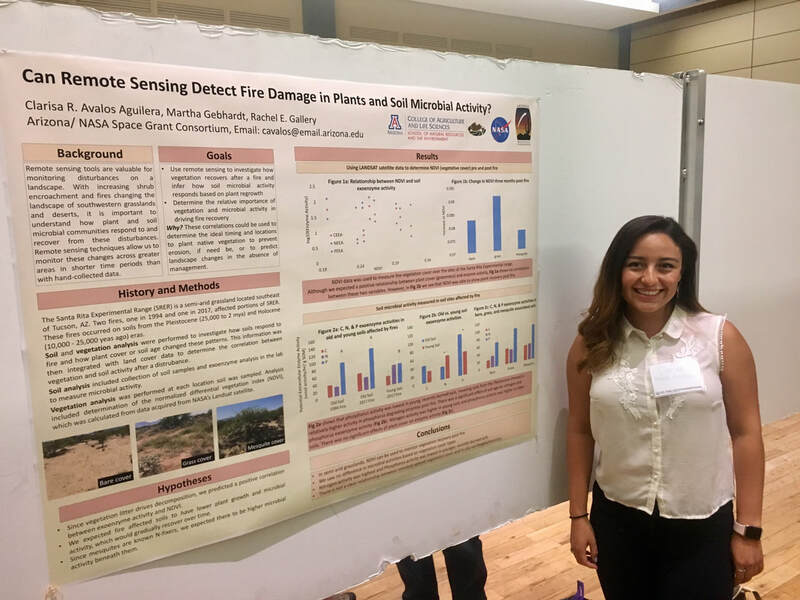 Her background in the Gallery lab will serve her well as she seeks to continue studying plant-soil ecological feedbacks in human dominated ecosystems.